The genius of Detroit's Woodward Dream Cruise is that it's mostly free, excepting fuel costs and if one avoids entanglements with Royal Oak's finest. But it was an expensive trip for the owner of this 1970 Plymouth Superbird, who got sandwiched on the ride home. Flagged down via CarDomain, the Superbird was reportedly exiting Woodward Avenue when it smacked the rear-end of a Silverado pickup and was then rear-ended itself. 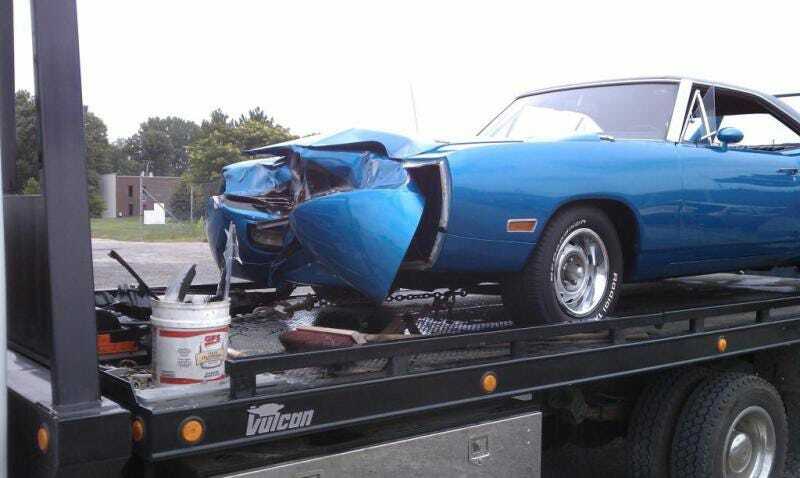 Its woes sparked a debate among Mopar-ians about the extent of the damage (consensus: break out the frame rail straightner) and whether the owner could mend his broken wings or be forced to push the Superbird out of the nest.